The duck boat that capsized during a storm in southwestern Missouri, which left 17 people dead, was raised to the surface of Table Rock Lake on July 23, 2018. 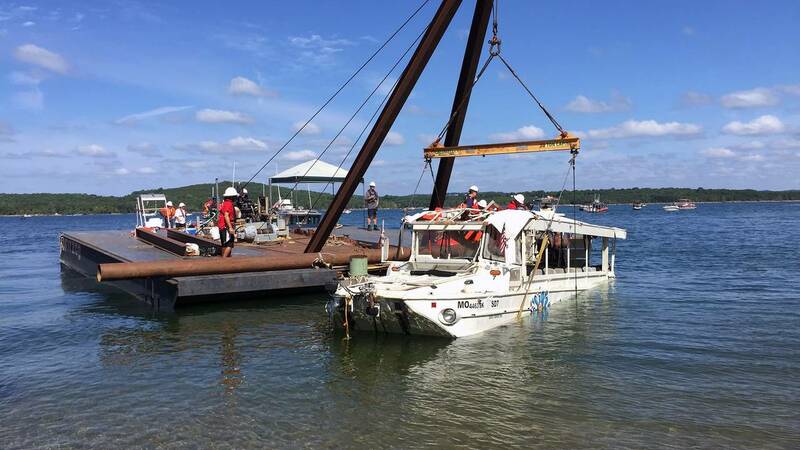 (CNN) - The duck boat that capsized during a storm in southwestern Missouri last week -- a disaster that left 17 people dead -- was raised to the surface of Table Rock Lake on Monday in an effort overseen by the Coast Guard. The Coast Guard surfaced the sunken duck boat on Monday and plans to take the boat to a facility for further inspection. The process to lift the boat and tow it to shore involved several divers, a barge crane and water pumps. Coast Guard Capt. Scott Stoermer said the vessel was resting on the bottom of the lake, about 80 feet underwater. Coleman said Monday night on "Anderson Cooper Full Circle" that her spouse tried to rescue their children. "Somebody told me that when they found my husband, he had all three of my babies." Coleman said this about survivors who have expressed guilt to her about not being able to save those who died: "We all went through something extremely dramatic, they should never feel guilty for surviving." None of the victims who died were wearing life jackets when they were found, a source with knowledge of the investigation told CNN on Sunday. Fellow survivor Talyssa Mann, a 19-year-old from Carlsbad, New Mexico, said Coleman's statement about life jackets was correct.